Activities of the offshore wind farm sector can be broken down by lifecycle activities, including Development and consenting, Design and Manufacturing, Construction and installation, Operation and maintenance & Decommissioning. What are the present spatial needs of the Offshore Wind Energy sector? The spatial set up of an Offshore Wind Farm (OWF) is important to understand the spatial needs of the sector. In locating an offshore wind farm, consideration must be given not only to the turbines themselves, but also the connections between turbines, the substation, and efficient connection to the grid on land (see figure below). Figure: Wind Farm Components and their Layout. Source. The spatial arrangement of the individual turbines is also important in the development of an offshore wind farm. Wind turbines extract energy from the wind and downstream there is a wake where wind speed is reduced, affecting the turbines downwind. A dense wind farm with turbines close to each other might seem spatially and economically the best option, but the wake might make the development less profitable. New policy developments to stimulate offshore wind developments. These include renewable energy polices at global levels (Paris agreement), European level (EU energy policy) and national targets, which will increase demand for space for offshore energy production. new technologies, such as floating, and technological innovation on energy storage and distribution will contribute to the deployment of new farms and increase the potential of offshore wind. Financial developments: Because of reduced development costs and an increased confidence of the economic potential of offshore wind, investments are ought to increase in OWFs and, consequently, increase their need for space. 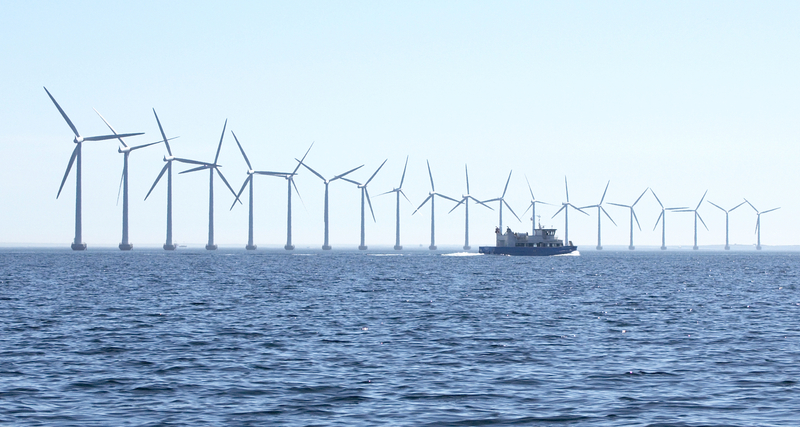 MSP planners should consider specific planning criteria for offshore wind farms, including water depth, wind speed, connections to land-based grids, etc. Please see the long version of the sector fiche for more information. Design criteria for offshore wind farms should also be taken into account, such as arrangement of turbines to reduce wake effects. Please see the long version of the sector fiche for more information. MSP can support offshore wind development in diverse ways, such as by helping establish consistency in policy and processes. Please see the long version of the sector fiche for more information. Deloitte (2017). Local impact, global leadership. The impact of wind energy on jobs and the EU economy. WindEurope (2017). The European offshore wind industry. Key trends and statistics 2016. Malhotra, S. (2007). Selection, Design and Construction Guidelines for Offshore Wind Turbine Foundations. PB Research & Innovation Report. How does sectoral planning for offshore wind energy relate to maritime spatial planning? Some sectoral plans have focused solely on identifying the most suitable locations for offshore wind arrays in national waters. For example, in the UK there has been a series of strategic plans used to inform the leasing of areas seabed for offshore wind development, based on analysis of ecological, social and technical spatial constraints. For example, in 2011 the Scottish Government prepared a strategic-level plan setting out potentially suitable areas within Scottish territorial waters. However, maritime spatial planning is a distinct process, which addresses all maritime activities within the boundaries of the planning area, and seeks to coordinate and balance the different uses. This may include offshore wind energy where the sector is supported by national policy. The MSP Directive states that the production of energy from renewable sources may be an activity to take into consideration in maritime spatial plans, alongside other uses and interests. Where the development of offshore wind is an important part of national strategies, maritime spatial plans have given special attention to offshore wind energy as a potential growth industry. For example, Germany’s federal Spatial Offshore Grid Plan takes a sectoral planning approach and is closely linked to the Maritime Spatial Plan for the German exclusive economic zone in the North and Baltic Seas set out the promotion of offshore wind energy as an overriding principle and they designate priority areas for wind array development. At the same time, the inter-relation between offshore wind arrays and other uses, such as shipping, is given careful consideration. Sectoral plans, such as that of the Scottish Government, may be a useful precursor to MSP, contributing important tools and information, to more comprehensive maritime spatial planning. The Blue-Seas Green Energy practice can provide more detailed information on this particular example. For example, also in the UK, the Crown Estate has developed a spatial data system for identifying the areas of least constraint for offshore wind energy development. How has maritime spatial planning been undertaken to support the development of offshore wind energy? Several maritime spatial plans have been completed in countries where offshore wind energy development is most advanced, especially in northern Europe. Wind energy has been accommodated in different ways, reflecting the nature of the plans themselves. Germany’s federal plans for its exclusive economic zone in the North and Baltic Seas, for example, set out detailed regulations for the development of offshore wind arrays and allocates precise areas where their construction is prioritised. These are generally defined by surrounding shipping lanes. The Netherlands’ plan for the Dutch section of the North Sea reiterates national policy and targets for offshore wind energy. It also designates suitable areas, but then provides an assessment framework that should be followed for determining the precise location of wind arrays, taking into account surrounding uses. The UK’s first completed maritime spatial plans, for part of the North Sea, provide information and policy guidance for the development of offshore wind arrays, setting out the conditions under which they would be permitted. They also indicate strategic areas that have already been identified as suitable for development, but do not precisely allocate any sites for arrays. Some experimental approaches have also been used. For example, in the BaltSeaPlan project, the decision support tool Marxan was used to suggest the optimum locations for offshore wind arrays in a transnational area in the southern Baltic Sea, taking into account the wind resource, cable costs, other uses and environmental constraints. Can maritime spatial planning be used to develop synergies between offshore wind energy and other uses? The MSP Directive promotes the coexistence of relevant activities and uses. By supporting the integration of different sectors / interests to optimise the use of oceans space and resources, it provides a framework for exploring co-existence of offshore wind and other sectors. This includes ‘co-existence’ in the use of the same space such as the management of fishing activity within wind farm arrays, as well as ‘co-location’ where multiple uses can be combined, e.g. with shared infrastructure. A number of scientific studies have been undertaken to explore the potential synergies between offshore wind energy development and other maritime uses and interests. These include the possibilities within wind arrays for: aquaculture; small-scale fishing; marine nature conservation and habitat creation; and tourism. For example, a study by the University of Hull, UK, reviews the potential for co-location of offshore wind arrays with marine protected areas, aquaculture and fishing. There is also some evidence of wind arrays acting as de-facto no-take zones, allowing localised recovery of fish stocks; also of turbine foundations acting as artificial reefs and being colonised by vegetation and shellfish. There are currently no well-known examples of formal arrangements for the co-use of wind array sites. However, the SeaPlan project has developed a framework for cooperation between offshore wind energy and commercial fishing organisations, including agreements such as as possible access for fishing, which could be used as the basis for developing such arrangements. A report published as part of the NorthSEE Project published in 2018 discusses how Navigational Risk Assessments (NRA) can improve safety between shipping measure and offshore wind farms in order to improve co-existence between two sectors and minimise conflict. The EU funded H2020 MUSES Project explored opportunities for Multi-Use in European Seas across all 5 sea basins. A number of case studies included examined the use of offshore wind alongside other maritime sectors. One such case study proposed alternative solutions for multi-use of ocean space between commercial fisheries (trawlers & scallop dredgers) and offshore wind development/cables routes of the East Coast of Scotland, to overcome barriers and conflicts, minimise limitations and maximise synergies between the two industries. Another case study investigated potential multi-use between offshore wind and mariculture in Rødsand 2 off the south coast of Lolland-Falster, Denmark.